The Dynamo is an ideal for an advanced player. The combination of a medium-soft sponge and an elastic surface increase spin and speed. Killerspin was built to bring youth and innovation to one of the world’s most beautiful sports, table tennis. The Chicago-based firm produces premium-quality table tennis equipment, sports apparel and media. Killerspin was built to serve the table tennis player. 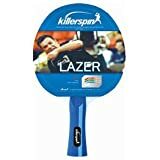 The Killerspin brands: Killerspin table tennis equipment lines. 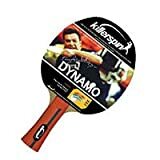 KS4HIM - table tennis apparel for men. KS4HER - table tennis apparel for women. Killerspin productions - sports media. The Killerspin Hard Racket Case is designed to hold up to 2 table tennis rackets. Made from semi rigid polyester for improved durability. The rackets are held in place with elastic fasteners. Hard Racket Case has been designed with players needs in-mind; intelligent, functional, and structural design coupled with cool styling. The product comes with a 30-day limited warranty.